I have always dreamt of traveling to Japan. To see the temples, to drive to Mt. Fuji, to have a taste of authentic Japanese cuisine. To immerse myself to their art and culture. I would often stay in front of my computer, watch documentaries about the "land of the rising sun". I don't know how many times have I watched "Jiro Dreams of Sushi" - but I just really love anything and everything about Japan. Until recently, Filipinos seemed to be frequenting this country. Last year, my Facebook feed were filled with friends, relatives and colleagues who spent Holy Week in Japan. I observed that the country is now a part of every Filipino traveler's bucket list. Including my own bucket list! Yes, you read it right. The universe granted my wish. I am going to Japan and I am excited about it. It will only be a short trip -- but what the heck! Not everyone is given this kind of an opportunity. And I am going to a magical place - a world class entertainment theme park! But before I reach that dream destination, there are things to be prepared. 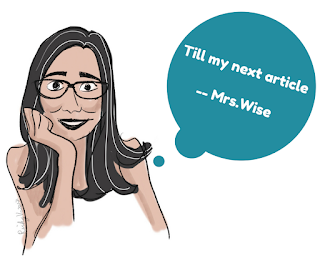 As I am writing this blog entry, I am awaiting for my Japan visa. I applied for a multiple entry (which I pray would be granted). Sharing with you the step by step process. Then, fill up the application form correctly. You will need to attach a 2 x 2 photo with white background. You also need to provide information of hotel/s you are planning to stay in while in Japan. Please see sample application form. Next, you need to sign an authorization letter, allowing a representative from an ACCREDITED travel agent. 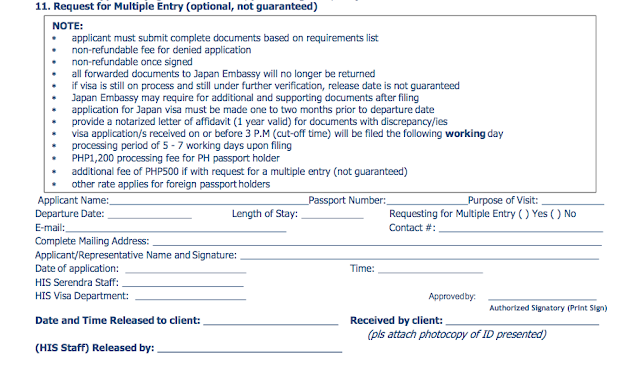 Unlike other visas, the Japanese embassy does not require applicants for a face to face interview. An accredited travel agent will lodge your Visa for you. 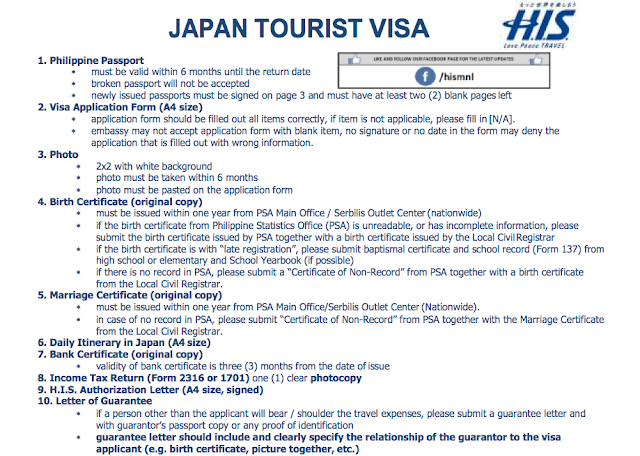 During peak season, let's say, the Sakura festival, it may take up to 7 days for you to get your visa. Sometimes it only takes about 3-5 working days. And because I am interested in applying for a multiple entry visa, I need to accomplish another form. 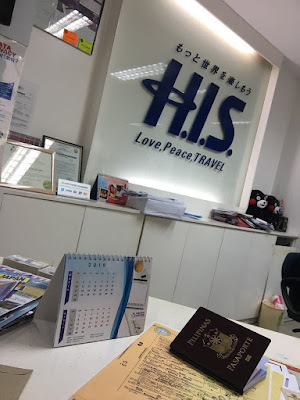 Since I am a tourist, and I did not travel to Japan in the last 3 years, I have to prove that I am financially capable, thus BANK Certificate/s are needed. Note banks certificates require minimal fee upon issuance from you bank. 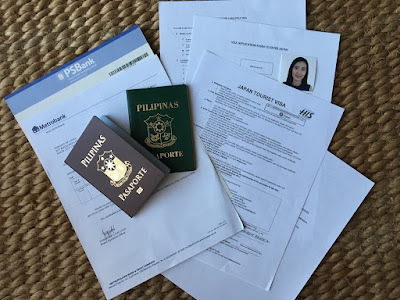 Now that I have completed all the requirements and have submitted everything to my travel agent, HIS Philippines Travel Corporation -- I am just awaiting if I will be granted a single or multiple entry visa. 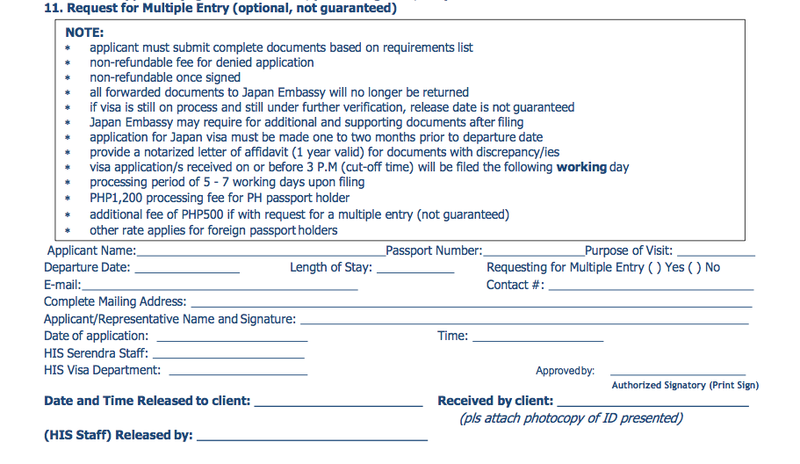 I got a call from His Philippines Travel Corporation saying -- I was granted MULTIPLE entry to Japan, valid for 5 years... yey! So now, I am so ready to embark on my first Japan adventure. Scheduled to travel to Osaka for 3 days then transfer to Fukuoka to meet my relatives for a summer adventure!